When it comes to handling angry customers who feel undeserved, not heard, or not appreciated, it’s often about doing the little things that can make it end up right. Companies large and small have been sued by unhappy customers who were merely looking for a little compassion, humility, and an apology from the frontline employees they were dealing with. In his bestselling book Blink: The Power of Thinking Without Thinking (2005, Little, Brown), author Malcolm Gladwell reminds us that physicians tend to get sued for malpractice by patients who believe their bedside manner is sorely lacking, abrupt, rushed, or dismissive. Yet, for those physicians who demonstrated real empathy, listening skills, and even the rare ability to admit they don’t have every answer, their rates of being sued was quite low. “Doctors are human and they make mistakes,” goes the reasoning of most people who did not consider malpractice litigation. When there is real empathy in the encounter, patients are much more likely to give the doctor the benefit of the doubt. However, when the patient feels overlooked and ignored, plaintiffs’ lawyers often get phone calls. The solution is not to round up your customer-contact employees and give them classes on how to be nice to customers. Many employees chafe when dragged into what they perceive as “smile training” programs, designed to make them more friendly. These programs teach platitudes and dubious techniques, like using the customer’s name frequently, memorizing catchy service slogans, or smiling constantly, even over the telephone. It’s not always easy to get employees who are tired, frustrated or apathetic to respond to the needs of entitled, angry, or simply confused customers who demand a high level of service. G – Greet the customer with genuine sincerity and, if it’s in person, real eye contact. R – Reassure the customer that you will take custody of his or her issue or problem until it’s solved. 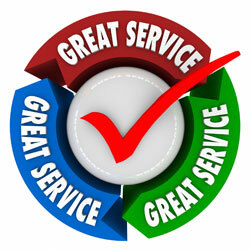 E – Explain what you will do or have done for the customer, giving as much detail as they may desire. A – Act accordingly and accurately, in terms of the duties you need to perform to truly solve the customer’s problem. T – Thank the customer for his or her cooperation, patience, and business. There is an old adage when it comes to improving customer service that sounds paradoxical and it is: a complaint is a gift. Negative customer feedback gives your business and your employees the chance to repair your image, your reputation, and improve the level of service you want to provide. Recovering the customer’s business starts immediately when the problem becomes apparent, not two weeks later. These five steps toward G.R.E.A.T. service can both change the way your customers see your employees and help your people lower the emotional temperature of each customer encounter. Dr. Steve Albrecht, PHR, CPP, is internationally-known for his consulting and training work in workplace violence prevention training programs, school violence prevention, and high-risk human resources. Steve continues to speak, write, consult, and train on tough organizational topics. Marketing and Customer Service: A Match Made in Heaven?